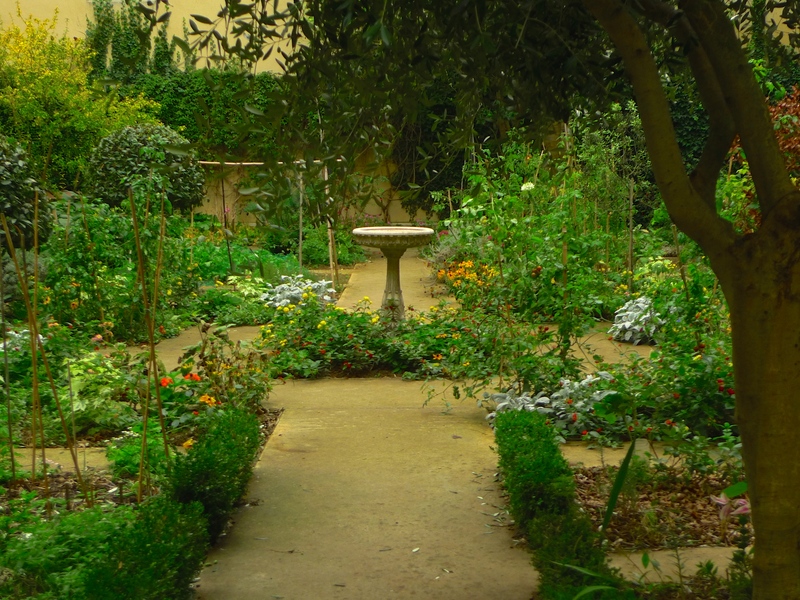 MANY PEOPLE VISIT GARDENS to look at them and maybe even smell them but few I suspect go to listen to them. It wasn’t what I had in mind when I left home, but I spent part of a recent Saturday afternoon doing just that – listening to a garden. I had decided to go to le Marais, a part of Paris I know reasonably well but don’t go to all that often, save for my regular visits to the Musée Carnavalet of course. I emerged from the Métro station Saint-Paul into the Saturday afternoon bustle of le Marias and spent the next three hours or so walking the streets, dodging the showers, listening and hunting for sounds to add to my Paris Soundscapes Archive. Towards the end of the afternoon I found myself in an unfamiliar street, Rue des Blancs Manteaux. I’ve since discovered that the street takes its name from a monastery where, in 1258, Louis IX settled beggar monks belonging to the order of the Servants of Mary. The monks were noted for the white habits they wore hence, Rue des Blancs Manteaux. Walking along the street I discovered the square Charles-Victor-Langlois, once the site of the monastery, a church, l’église Notre-Dame-des-Blancs-Manteaux and a theatre, le théâtre des Blancs-Manteaux. 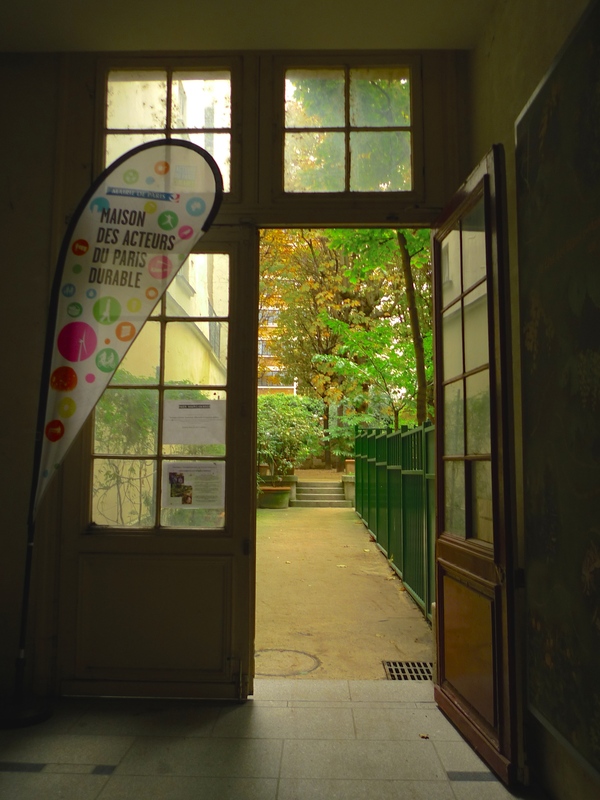 But it was at N° 21 Rue des Blancs Manteaux that I came upon a complete surprise. Behind a large wooden door was a passageway leading to a garden, the Jardin Partagé du Clos des Blancs Manteaux. L’Association des Jardiniers du 4ème (4th arrondissement Gardner’s Association) opened a small garden here in October 2010, which was extended in 2012. 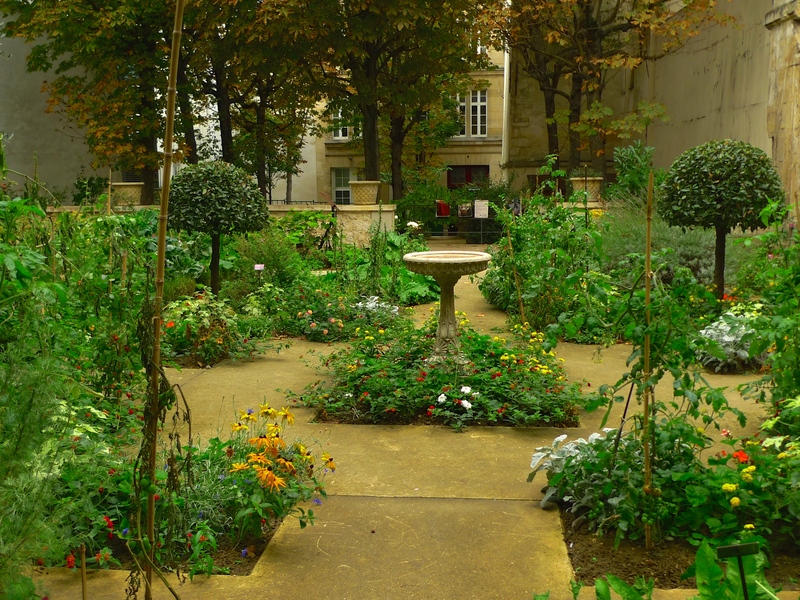 Nestling at the bottom of a former schoolyard, the 100 square metre garden is maintained partly by the Gardner’s Association and partly by the Paris City gardeners. 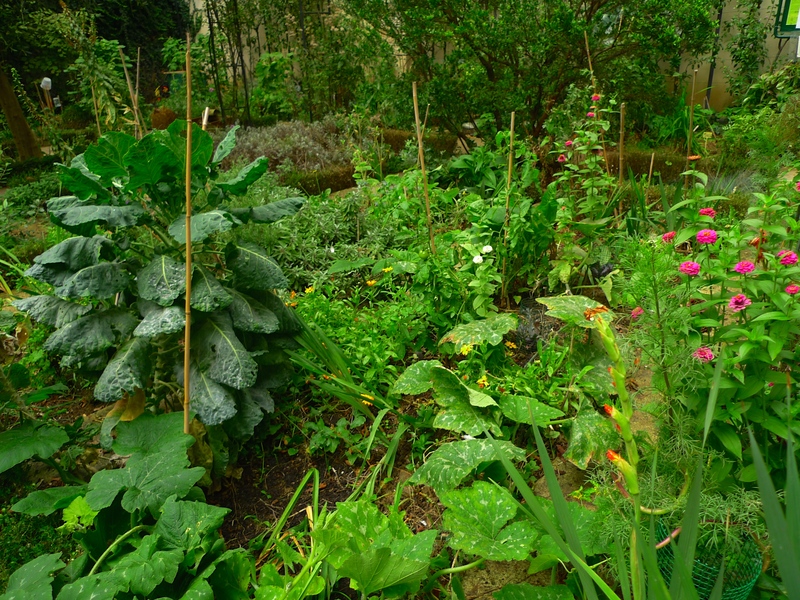 The garden is divided into separate plots including vegetable plots based on the theme of ‘urban agriculture’, with peas, tomatoes, herbs, potatoes and maïs amongst other things. I went to investigate the garden and was immediately struck by how quiet it was. The quietness was enhanced because, with the bustling streets of le Marais just a few steps away, quietness was not what I was expecting. So unusual is quietness in the heart of the city that I couldn’t resist capturing it. As I began to record it started to rain so I had to scurry off for shelter under a rickety wooden roof covering the compost. It was from there that I listened to and recorded the sounds in the garden. Listening to the garden was fascinating. The sounds of light rain falling intermittently, dead leaves rolling on the ground, the gentle rustle of the plants swaying in the wind and two ladies walking round the garden talking and passing right in front of me standing amidst the compostage were overlaid with the faint rumble of traffic in the distance, a light aircraft flying overhead, distant birdsong and remarkably, the brief sound of a demonstration drifting on the wind all the way from Place de la Bastille. As a professional listener to Paris I have some sympathy with John Sanderson and his first impression of the city. 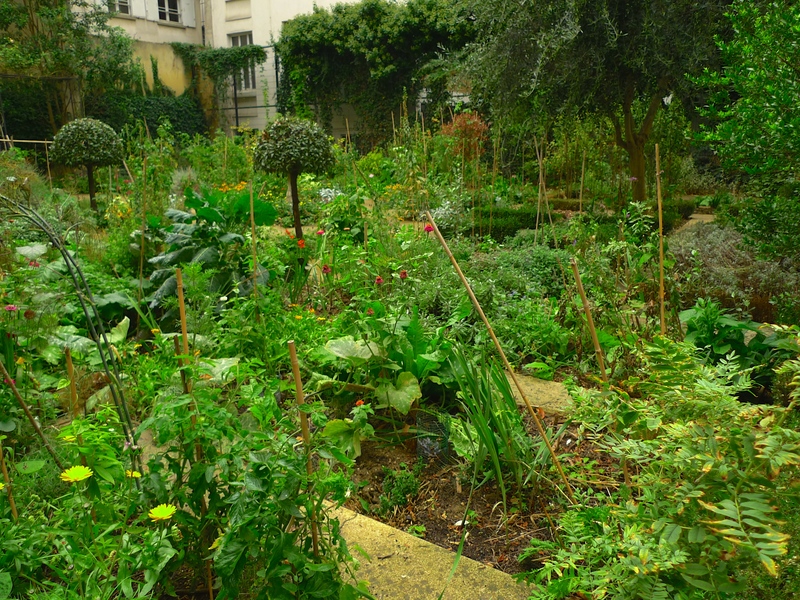 But in the Jardin Partagé du Clos des Blancs Manteaux the sounds of the street, the ‘noise that never dies’ just a few steps beyond the wooden portal, if not in complete repose are at least subdued enough to let the garden speak for itself.